March 31st couldnt' have been more perfect for driving as our first day back on the road. We left Melbourne a day early wanting to avoid part of the snowbird exodus. Traffic wasn't bad. I think it helped that we were traveling east to west instead of directly north. We saw other RV's but nothing like the massive slowdowns and frustrated drivers we had been warned of. We got in a solid 320 miles before stopping for the night. We overnighted in Tallahassee at a Harvest Hosts stop, The Tallahassee Automobile Museum. This is the first Harvest Hosts that we have used that wasn't a farm or winery. We arrived near closing so left our exploration until Saturday morning. That's the Behemoth parked under the chin of this giant steer. The museum grounds are beautiful with expansive lawns and mature trees. There are about a dozen outdoor art installations that include this giant steer, an Uncle Sam statue of similar proportions and a batmobile model right by the front gate that had been used in filming on one of the movies. Museum staff asked us to park on the grass by the road, a nice shaded area where our only company was a Winnebago on static display. It made us feel right at home. We were glad to be able to get out and stretch our legs with such a pleasant place to walk. This Bat-mobile model was used in the filming of one of the movies. Note the eye hook on top. The museum opened at 10 on Saturday morning and we were happy to give it a look. The Tallahassee Automobile Museum is the private collection of self proclaimed, self made man DeVoe Moore whose political views and social opinions are exhibited right along with his collections. There are over 150 classic cars on display in this 2 story building. We enjoyed spending an hour walking among them. Fred enjoyed the muscle cars of the 1960's and 70's and some older elegant models. There was a grouping of Batman memorabilia that includes 3 Bat-mobiles and Penguins Duck car. The Television version of the Bat-mobile. We located one of the stately black horse drawn hearses that carried the body of President Abraham Lincoln during the 3 week funeral ceremonies as his body was transported from Washington back to Springfield Illinois for burial. 1860 Horse drawn hearse believed to have been used to carry Abraham Lincoln. I was amazed by the workmanship of a Steinway piano designed by artist Dale Chilhuly for the Salt Lake City Olympics in 2002. The lacquered case gleams under spotlights and is a perfect frame for Mr Chilhuly's colorful artglass designs that adorn the plexiglass lid. We were not expecting to see so many collections. Mr. Moore has an abundance of made in America artifacts. Wooden boats and Pedal Cars. Steinway pianos and Law Enforcement badges. Cash registers and photos of professional athletes. Golf clubs and Native American artifacts. Knives, did I mention the cases and cases of knives? It was information overload. There were so many things to look at that it difficult to concentrate on one item without being distracted by its close neighbor. 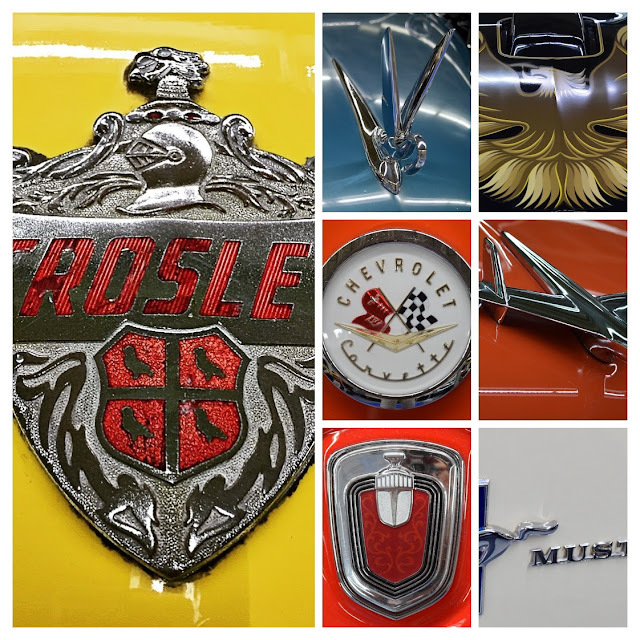 We enjoyed spending an hour walking through the aisles of the Tallahassee Automobile Museum. It is not a typical museum experience, more like walking through a very clean antique barn where all manner of things are stored together in close proximity.